Sadhvi Pragya Singh Thakur has challenged the slapping of the stringent Maharastra Control of Organized Crimes Act (MCOCA) against her. Lt. Col Prasad Shrikant Purohit has claimed he was a millitary intelligence officer who had succeeded in infiltrating several militant Muslim organisation, including the Students Islamic Movement of India(SIMI).He has cotended that was falsely implicated in the case by the Maharatra Anti-Terrorism Sqad for political reasons. Purohit has sought bail on the ground that no chargessheet had been filed against him by the NIA and hence any trial would take several years. Both have been in jail for more than six years now. The Maharastra government’s counsel has already concluded his arguements in the case, opposing the bail plea. It has been alleged by the prosecution that Sadhvi took part in a conspiracy which led to the attack at Malegaon in the year 2008. 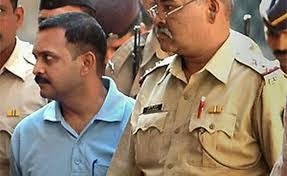 In the case of Purohit, It was stated that he had procured 60 kg RDX and supplied it to the other accused. The National Investigation Agency(NIA) has decided to oppose in the Supreme Court the bail plea by the accused in 2008 Malegaon blasts case. The agency is also going to urge the court to grant NIA further police custody of all accused, including Purohit and Sadhvi.